The farmhouse was ablaze, fire sprouting from the thatch roof and billowing dark clouds into the gray sky. By the well, Tani stood with a broken spade haft in her hand. Blood ran down her temple and pooled in the hollow of her shoulder. Sitting astride Rock, Paul’s great destrier still in its raven barding, was the Bearkiller. In his hand was Paul’s sword. When he saw Paul, his grin was immense. Paul felt his legs go to jelly and his arm felt like a hundred daggers were piercing it. He felt sick and his body threatened to loose urine into his pants again. He tried to force the fear away but only succeeded at keeping his britches clean. His voice was shaking when he spoke. “What did you do to her?” he asked, looking at the blood running down Tani’s face. She wasn’t paying attention, but simply gripped the spade handle tightly, a tortured grimace on her face. She kept looking at the burning house. Her grandmother’s body is burning, he realized. “My nana is dead you big ox!” Tani shouted and raised the haft of the spade as if to strike at him. “No, Tani!” he shouted but it was too late. Bearkiller grabbed the wooden handle in mid-swing and wrenched it free from her hand. With a quick swat, he struck Tani in the stomach with it and sent her reeling against the well. The girl went to her knees, coughing and groaning. Anger rose in Paul. Seeing her treated that way after all she’d done for him, all she had suffered. The anger erased his fear. “Come then, try me!” he shouted. His mind saw what his dreams tried to tell him, to warm him. The man on the bear with my sword. The raven with the inner eye, she meant me. “Tani, run!” he shouted. If he died here, at least he could save her. He owed her at least that. And then the horse reared and Bearkiller pitched backward, scrambling to keep his seat. Tani was kneeling, her arm still outstretched, fingers pointing at her target. Blood dripped down Rock’s neck as the horse landed on all four hooves again. His good eye looked straight at Paul and blinked in recognition. “Rock!” Paul shouted. “Up!” Paul threw his hands into the air and Rock reared again, higher this time, standing on his back hooves. Bearkiller grasped for the reigns but missed and came crashing down to the ground. In his plate and mail he sounded like a jumble of pots falling into a heap. The fear returned then in an instant, his anger threatening to be drowned in it. He’s a giant, he thought in a panic. What could I do against a giant? He took one step towards them but stopped as Bearkiller squeezed again and Tani let out an anguished cry. Paul watched the big man stand up, and his grip on Tani made her feet rise off the ground. She’s going to die unless I do something. Do something you bloody coward! She was kicking at him, legs flailing until they connected with his plated knee. There was a loud clang and he grunted but his grip simply tightened. Paul heard a snort behind him and he turned to see Rock shaking his head, his one remaining eye staring at him through the blue-plated raven helm. The destrier snorted and stamped a front leg. The sound of a sword being unsheathed turned his attention back to Bearkiller, who now had Paul’s own sword drawn, its deadly point pressed against Tani’s belly. He leaped onto Rock’s back, and was charging the big man before he realized what he was doing. He urged the warhorse faster, digging his heels into his flanks. Bearkiller turned just in time to take Rock’s charge in the chest. It knocked him sideways, spinning. He lost his grip on Tani and the girl dropped to the ground, along with Paul’s sword. Bearkiller stumbled and went to one knee, his breastplate dented and breath coming in great gasps through that thick beard. As he wheeled his horse around for another pass, Tani reached down and picked up the sword. “Tani!” he cried but she didn’t hear him. Her hands were wrapped around the sword hilt so tight the blade shook. Her eyes were staring hatefully at the large man kneeling on the ground. Rock’s hooves dug into the earth as Paul urged his horse towards the downed man again, but Tani was already moving. With the sword high above her head, she cried out in anger and sorrow and swung down with all her strength. It was a blow made soft by the very way she used the blade. Untrained as she was, her grip was too hard and the angle too stiff. The edge caught nothing but the gorget around Bearkiller’s neck, the blade sparking as it scraped across the metal plate. Bearkiller turned and slapped her with metal-backed knuckles. She stumbled and fell, blood spilling from a gash along her cheek. She still held the sword. Paul angled Rock towards her and bent low over the side. “Give it here!” he shouted to her. She tossed the sword to him and it was only by luck that she managed to place the throw so perfectly that he snatched the blade out of mid-air by the pommel and in the same motion, cut upwards as Bearkiller turned to face him. He felt the blade cut deep. It caught the big man in the mouth, severing part of the upper jaw and cheekbone. At the same time however he reached up and planted his fist into Paul’s chest. There were several wet snaps and he was suddenly falling, twisting, the world spinning around him. The ground rose up and smacked him in the face and then drove itself against the rest of his body. His hands let go of the sword and it tumbled away out of sight. The pain was immense. Even when he’d had his shield shattered, Paul could not remember it hurting this badly. Every breath he tried to take was agony and he tasted blood in his mouth. Nothing would move and he could not feel his legs or his hands. All he could see was Bearkiller struggling to sit up, his ruined face a mass of teeth, bone and blood. And then he saw Tani with a rock in her hand. There was a loud crunch as she brought it down onto Bearkiller’s head. His vision faded and the last thing he heard was Tani’s anguished scream. This entry was posted in Fantasy, Original Fiction and tagged Clans, Fantasy. 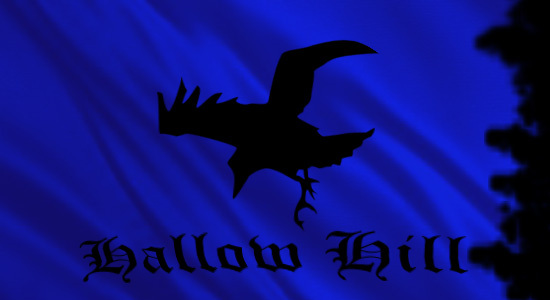 Medieval, Hallow Hill, Houses, The Saga of Aranor, Thegn. Bookmark the permalink.